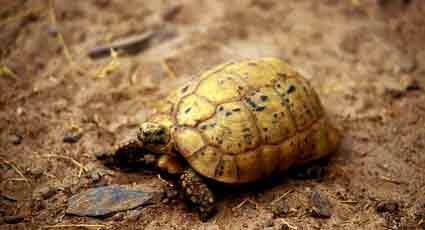 Libyan tortoise - this tortoise requires a sandy, dry substrate. If maintained on grass or upon a moist substrate it will suffer shell and respiratory infections. 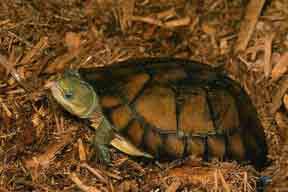 Along with heating and lighting systems, the choice of substrate in tortoise vivaria and terraria often causes a great deal of confusion to keepers. Some substrates are excellent, others positively lethal. In this article we help you to choose a safe and appropriate substrate, and show you how to avoid those that could kill your tortoise. One important factor to recognize is that different types of substrate retain different levels of moisture. Clay type soils and forest type substrates hold far more moisture than do sandy, desert substrates for example. The drainage factor between these different classes of substrate is entirely dissimilar. This in itself has a profound effect upon creatures that are, at best, ever only a few inches away from the surface – and in many cases are completely surrounded by substrate. It is therefore common to see cases of ‘shell-rot’ and respiratory disease in arid-habitat species that have been kept on moist substrates, and dehydration in rain forest habitat species that have been kept on dry, desert type substrates. 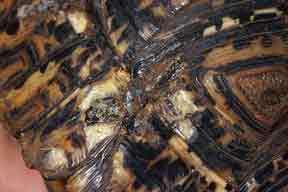 A rather nasty case of 'shell rot' on this Leopard tortoise that had been kept in thick, damp grass. It was also sufferring from respiratory disease. Many people assume that grassy lawns are a suitable substrate – this is rarely the case. Lawns are actually fairly moist, and cases of shell-rot on the plastron are very often seen in tortoises maintained in this way. Some access to a grassy grazing area is excellent for certain species (Leopard and Sulcata tortoises, for example), but a drier area must also be provided. Many species need to be able to burrow or to excavate shallow ‘scrapes’, and the substrate used within their habitat should permit this. These burrows and scrapes are vital microclimates – and where tortoises are deprived of these facilities a whole train of important self-regulatory functions is disrupted. One of the most common results, in arid-habitat species, is the formation of bladder stones due to constant, chronic dehydration (see our other article, 'Microclimates in Captivity' for more on this topic). It would be a mistake to believe, however, that microclimates were all that we need to consider. 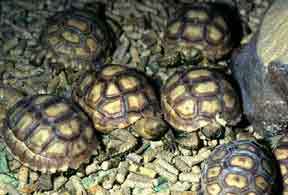 Thermoregulation and temperature stability are also greatly affected by the substrate that tortoises’ experience. In nature, the substrate is typically infinite in mass. Even in quite harsh environments it is offers relative stability (not necessarily directly at the surface, but certainly below it). 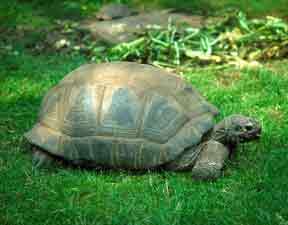 Tortoises and other reptiles use these properties extensively in their own thermoregulatory behavior. The degree to which they allow body contact with the substrate, for example, may allow either a positive or negative heat flow to occur. Some species gain most of their heat via basking; others gain a substantial proportion by contact with warm substrates. Some species do both. One area where substrate mass and temperature stability is especially important is in hibernation. As we all know from basic physics lessons in school, the smaller an object’s mass, the more rapidly it will respond to external changes in temperature. In simple terms, a 2 cm square block of stone will heat up and cool down much more rapidly than one of 20 cm square. This is especially critical for hatchlings and juveniles, as being small, they respond very quickly to external temperature variations. To provide much greater temperature stability to hibernating juveniles, then, we can provide a deep tray of earthen substrate into which they can burrow. Surrounded by this mass, their ‘thermal inertia’ is greatly increased. Pet shops routinely sell all kinds of ‘special’ substrates that are touted as ‘ideal’ for use with tortoises and turtles. In our experience this is not the case – we would not use of recommend any of these ‘commercial’ substrates ourselves. Very prone to clumping. Can cause eye irritation. This product has been reported to be implicated in numerous cases of gut impaction. We encountered one such case only recently. The tortoise died. This product is also very dehydrating. We do not recommend use of this material under any circumstances. 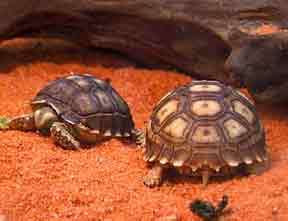 The tortoises (G. sulcata) shown below were acutely dehydrated after being kept on this material in a reptile store's display vivarium. Often based upon coconut and similar fibers. Can be very dusty. May be ingested. Dehydrating. Fails to provide any thermal advantages. Most fiber substrates are an ideal culture base for mould, or parasitic and bacterial organisms. Dehydrating. Has been associated with fungal eye and respiratory infections. High protein content if consumed. We now recommend avoiding. These juvenile Geochelone sulcata (African spurred tortoises) were extremely dehydrated due to the hygroscopic effect of the 'rabbit pellet' substrate they were being kept on. Highly toxic when heated, emit noxious fumes. Serious risk of impaction if ingested. Avoid! Although used by many keepers, we do not recommend this material. It has been associated with SEVERE INJURIES and DEATH. See our separate article. Fails to provide any microclimate opportunities whatever. Flammable – use with care near heat sources. Several fires have resulted from paper substrates that have been ignited by heating devices or basking laps. Use with extreme care. The substrate that we have found to be the most effective and safest by far consist of a mixed loam compost base mixed with varying amounts of soft (play) sand. This needs to be of sufficient depth, about 50mm or 2 inches is recommended as a minimum. Increase the proportion of sand for very arid habitat species (our Testudo kleinmanni have a 30/70 loam/sand mix, for example). 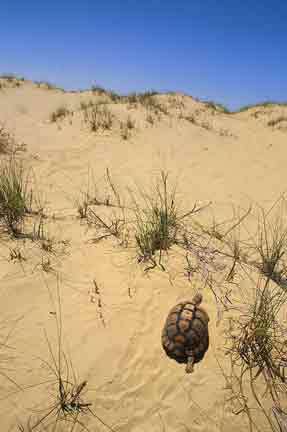 Decrease the sand for more humid habitat species, to say 60/40 loam to sand for a Kinixys (Hingeback) tortoises or American box turtles (Terrapene sp. ), for example, and mix in some fresh sphagnum moss, leaf litter mulch and similar moisture retaining additives. 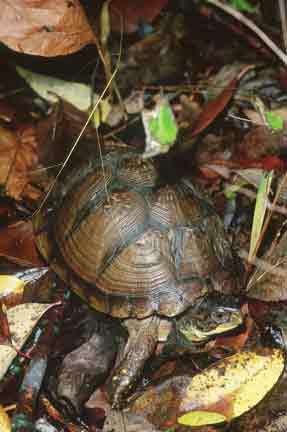 An excellent substrate for American box turtles (Terrapene carolina) - it should be! This photo was taken in the wild, and clearly illustrates what these animals actually live on. Some experimentation may be required depending upon exactly what type of loam and sand you use, but in general terms, this substrate is cheap, easy to clean, offers excellent thermal ‘cushioning’, provides excellent microclimate opportunities, and has proved consistently safe with every species we have kept. It should be changed every few weeks. Interim maintenance can be carried out by ‘surface scraping’ from time to time as necessary. Some concerns have been raised regarding the possibility of ingestion. We have not found this to be a problem despite several years of intensive use. We place ceramic tiles in feeding areas, and utilize a very high fiber diet. This assists any ingested material to ‘pass through’ safely. Do not forget that many of these species live on an almost pure sand substrate for their entire lives in nature!! © All text and photos A. C. Highfield 2001-2008.